This exhibition will immerse viewers in a range of Michael Brophy’s gouache works on paper, a medium that has long been a mainstay of his painting practice. He will present several series of small scale images that range from a geographic array of Oregon landscapes in Pacific Wonderland and Cascadia Exit, to a boldly colorful font series entitled All American True, inspired by illustrated comics and graphic novels of past and present, to more meditative, abstracted studies of the mundane in River Objects. Northwest artist Michael Brophy graduated in 1985 from the Pacific Northwest College of Art, where he has also taught. He has shown extensively in the Northwest in both solo and group exhibitions. His work is in collections including Microsoft, the Multnomah County Library Collection, the Portland Art Museum, the Seattle Art Museum, the Tacoma Art Museum, OSU Library in Corvallis, and the City of Portland, OR. Public commissions include work for Portland’s City Hall, the Columbia Gorge Discovery Center in Wasco, OR, Mt. Ranier High School in Des Moines, WA, and most recently a series of gouaches for the Oregon Department of Transportation. 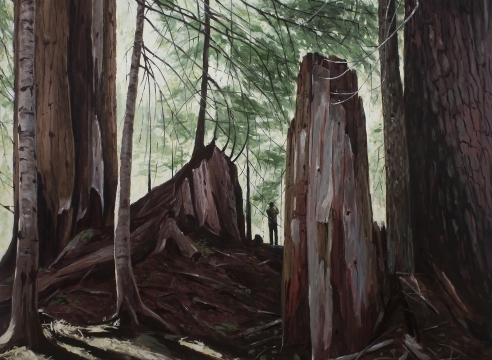 Earlier this year, he was featured in Cascadia, an exhibition of international artists at The Reach Gallery Museum, in British Columbia, Canada.